When you think of the Danish metal scene, black metal isn't exactly the first genre that springs to mind. But in Solbrud us Danes now have a black metal band that we can be proud of. 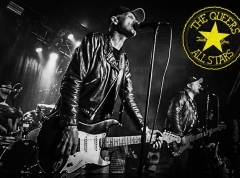 The band was formed in 2009, and this self-titled debut album is being released two years after the band's first and only demo was released in 2010. Solbrud have played Copenhell and various support slots for international black metal bands in Copenhagen, and with the release of their debut they've received plenty of reviews praising them to the skies. 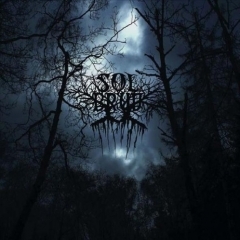 Solbrud are clearly heavily inspired by the atmospheric black metal movement fronted by the likes of Wolves In The Throne Room. Their lengthy compositions range between 7 and 15 minutes of atmospheric black metal, with shrieked vocals alternating between the English and Danish languages, samples of rain enhancing the atmosphere of the songs, repetitive simple tremolo riffs that slowly change the course of the album as well as drums deciding the tempo of the songs, as they vary from blast beats to mid-tempo and even ventures into droning territory in the intro to opening track "Bortgang". This is the basic formula for this type of music, and Solbrud do indeed never present anything particularly original. But in honing the bands that inspired them, Solbrud have written songs that I'm sure Wolves In The Throne Room would approve of. But while I can certainly also approve of this debut, I'm sadly not able to give it the praise that other peope seem to give it. "Solbrud" consists of four tracks, and two of those are re-recorded versions of their demo from 2010. And here's my problem with this release: the re-recorded tracks from the demo are vastly superior to the two new songs, "Bortgang" and "Dødemandsbjerget". While the term "repetitive" is usually not meant in a negative way in the context of a long, atmospheric black metal track, the two new songs mentioned above get too repetitive at times. In the tracks from the demo, "Øde Lagt" and "Skyggeriget", the repetitive guitar riffs always seem to be leading somewhere, and lo and behold, they always do. "Skyggeriget" is a 15-minute epic that alternate in tempo and mood repeatedly, bringing to mind Wolves In The Throne Room's masterpiece album "Two Hunters", and the main riff and feeling of "Øde Lagt" perfectly conjures up a feeling of despair and sorrow with the shrieked vocals courtesy of Ole Luk narrating the journey. These excellent songwriting abilities just aren't shown in the two new tracks, as those songs tend to drag on for far too long without really making any insteresting riffs or compositions see the light of day. But as said in the opening paragraph of this review, Solbrud are still a band that us Danes can be proud of. "Solbrud" is a good debut album, an album that showcases an ability to write great tunes. It is that ability that the band need to utilize, so that we may see a sophomore with all killer and no filler. Solbrud are definitely a Danish band worth paying close attention to.